As a teen I volunteered at a large zoo, and later worked in a couple pet stores with exotic birds and reptiles, and then spent almost 20 years workings hands on with wolves in captive situations in licensed facilities. I rubbed elbows with wild wolf researchers and those working with other captive wildlife big and small. My early interest in big cats became a lifelong passion for canids and their behavior and that has been the focus of my life. 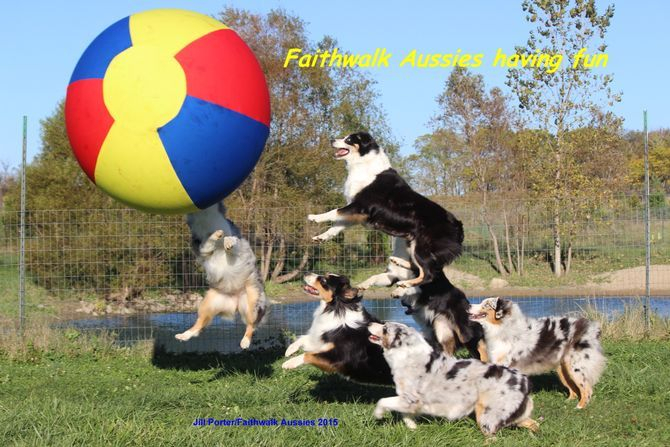 I raised and trained a sled dog team that I ran all over this part of the country, and later fell in love with the Australian Shepherd after rescuing one. It was in living with and working with the wolves that I realized how critical quality of life and enrichment is for all animals, captive wildlife and domestic animals. I learned what each species and animal needs and worked hard to give it things to do to meet those needs. When you go to the lower quality zoos and see animals pacing or doing other stereotypic behaviors, you know their needs are not being met. Same for dog kennels where dogs pace and bark all the time. It's very sad for such animals. I have also studied and observed the social behavior of wolf packs as well as dogs living in a pack situation (as pets, but in groups), and also learned various effective training methods from some of the best in the field. I learned much about medical care, nutrition and so many more things in my decades of working with these animals. I still spend a great deal of time learning all I can and am glad that more positive training methods are becoming the normal way of working with all animals. I owe a huge debt of gratitude to all the people and animals who have taught me and helped me become who I am today. I believe in paying it forward and that is the biggest reason I built this site. I don't want it to be a "breeder" website but a resource for all kinds of information on this breed and dog care in general. I have put all my years' experience in giving my current dogs the best possible quality of life possible. It blesses me to see them thrive and enjoying life to the fullest, and I want to share that with anyone who wants to learn. As you can tell by this large photo content of this site, I really enjoy photography, especially animals and nature. I almost always have a camera in hand as I play with and train the dogs, as it's a fun way to capture various aspects of their life and behavior. I enjoy documenting behavior and interactions as well. I also take a camera on our hikes and adventures. Hardly a day goes by I don't take pictures of something. I just find so much of God's creation so amazing and wonderful, and I want to share that with others. I think it's one of the ways my artistic talent is expressed. I also contributed content and photos to Nicole Wilde's two books on wolfdogs. My articles have been published in a number of magazines in this country and abroad, mostly Canada and Europe. At least one article was translated into German to be published in Austria. Writing is another passion of mine, as is education on everything canine. I used to travel the US doing educational presentations to all sorts of groups and individuals in schools and other facilities, and to various clubs and private organizations. I have spoken to groups large and small in many states and done thousands of presentations in my lifetime. I figure I have had many good teachers through the years and I want to pay it forward, plus help others become better caretakers of the animals in their lives. One last thing that I am sure you have noticed on my site. I am a Christian and love the Lord with all my heart. I give Him all the credit and glory for my life and all I've been blessed with. My daily prayer is to have a more Christ-like character and to be able to bless those around me. I strive to build up others in any way I can, through sharing my time, my experiences and knowledge. We have some big news! We just bought a big new farm house on a little more land than we had at our last place. We now have our own pond for the dogs, as well as a new building so we can offer behavior seminars and programs. My husband is happy to have some big barns for his interests. We are still in the same area, near the IN/MI/OH border. 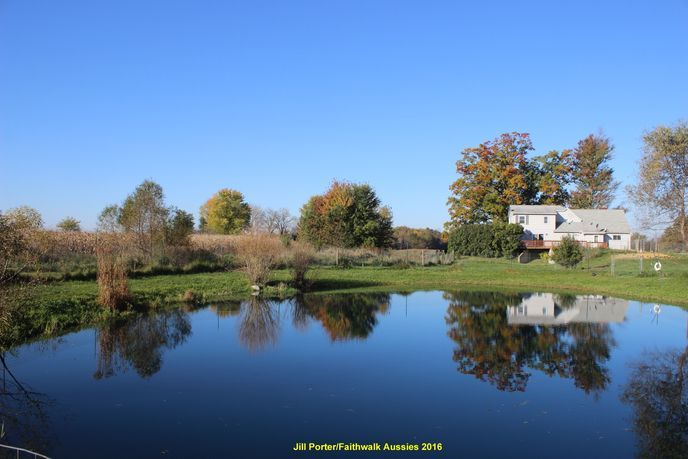 I added a photo above of our new place, taken recently in the fall and over the pond in the middle of the yard. I love the reflections! The dogs are loving having more room, and so are we! "Cast thy burden upon the Lord, and He shall sustain thee; He shall never suffer the righteous to be moved." "He is my other eyes that can see above the clouds; my other ears that hear above the winds. He is the part of me that can reach out into the sea. He has told me a thousand times over that I am his reason for being; by the way he rests against my leg; by the way he thumps his tail at my smallest smile; by the way he shows his hurt when I leave without taking him. (I think it makes him sick with worry when he is not along to care for me.) When I am wrong, he is delighted to forgive. When I am angry, he clowns to make me smile. When I am happy, he is joy unbounded. When I am a fool, he ignores it. When I succeed, he brags. Without him, I am only another man. With him, I am all-powerful. He is loyalty itself. He has taught me the meaning of devotion. With him, I know a secret comfort and a private peace. He has brought me understanding where before I was ignorant. His head on my knee can heal my human hurts. His presence by my side is protection against my fears of dark and unknown things. He has promised to wait for me... whenever... wherever - in case I need him. And I expect I will - as I always have. He is just my dog."